Struggling to see how a pampered pooch (not unlike the one pictured above) has just managed to bag the Best of Breed title in the Gundog Category at today's Crufts? Let me tell you that dog had been groomed within an inch of its life; it would not last five minutes out in the field with a coat (or should that say, skirt?!) like that. Yes, folks, Crufts is back! Huh. 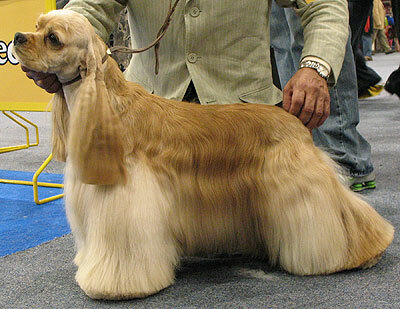 I've heard they use hairspray - even though it's supposed to be banned at Crufts. Hairspray! What sort of dog allows itself to be treated in this way? Speaking as a gundog (failed - can't stand guns), you are spot on about that skirt, Woof Woofington. My view on dogs, tails, and so called country sports is this: if a dog's tail isn't safe when it's 'working' and the only way to make it safe is to cut it off, then maybe that dog is in the wrong line of work. Human beings have got a lot to answer for, in my opinion. it's Brilliant, expected nothing less from the greatest sport ever, the American Football!!!!! the football can beat the cr*p out of any sport, even that sissy rugby with their freakin' tiny boxers!!!!! in usa we play rough, we play hard, we play tough, we play FOOTBALL!!! !